Up for auction recently at Bonhams, a British auction house and one of the world's oldest and largest auctioneers of fine art and antiques, was perhaps one of the earliest souvenir buildings. 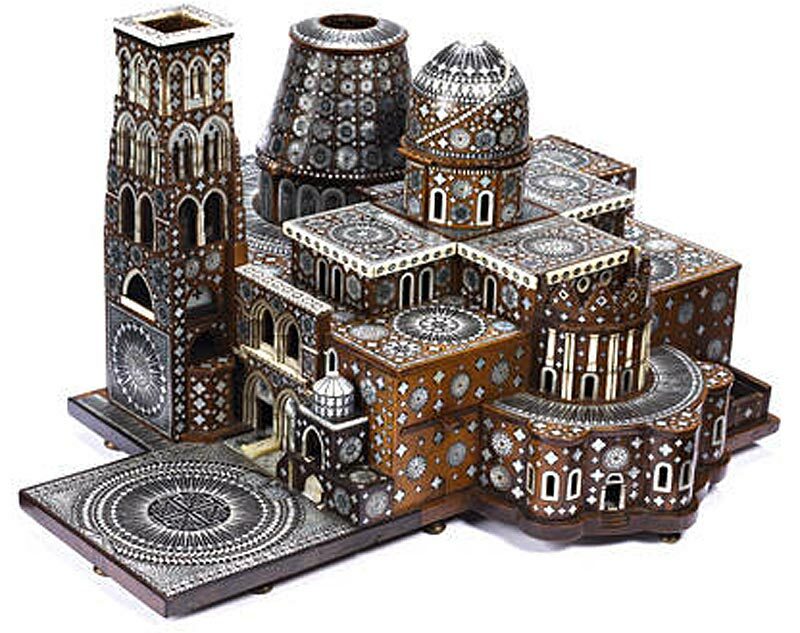 The 17th / 18th century model of the Church of the Holy Sepulchre in Bethlehem is made of bone, mother of pearl and olive wood. Thanks to David W. for the tip about this auction. Composed of numerous removable sections, the upper section is inscribed, “Oriens, Meridies, Septentrio, Occidens.” The interior also fully inlaid and it stands 15.5" high by 19" wide. Similar models are in various collections including the Victoria and Albert Museum and the British Museum. These models record the rebuilding of the tomb and Church by Boniface of Ragusa in 1555 and appear from the early 17th century onwards. They appear to be related to drawings of the church made by the architect and Franciscan Bernadino Amico in the 1590s, for model makers to use. These models were probably made in Bethlehem under Franciscan supervision as gifts for diplomats and rulers and as souvenirs for grand tourists. There is an example of one recorded in the Danish Kunstkammer in 1674 and another is datable to the same period as it appears on the arms of Charles II and Catherine of Braganza. A similar example of was sold at Christies, King Street, London, 5 December 1995, lot 64 for £14,950. The city of Jerusalem is unique in being sacred to three religions: Judaism, Islam and Christianity. The Church of the Holy Sepulchre was built by the Roman emperor Constantine I 'the Great' (reigned 307-37) in 325: it contains the site of the Crucifixion (Golgotha), the Tomb of Christ (the Holy Sepulchre), and the grotto where St Helena discovered the Cross (known as St Helena's Crypt). The Anastis (Resurrection) Rotunda encloses the tomb. The building was magnificently decorated; marble walls contrasted sharply with the coffered ceiling painted in gold. Wow , it looks gorgeous. Its a shame it isnt commercially available. Shouldnt be too hard to get Palestinian contractors to mass produce them as they do with other souveneirs.